As you would have heard and read in my earlier post, Biotherm is amongst a leading group of beauty brands to lower their Australian retail prices on many of their top selling products. Biotherm's timing couldn't be better as it coincides with the 10th year Biotherm has been in the Australian market. So to celebrate the occassion and thank the local market for their support, the good guys decided to run a competition on their facebook page and let you guess their new lower prices on various products for a chance to win a A$500 Myer gift voucher or 1 of 20 Biotherm moisturisers. So what are you waiting for? 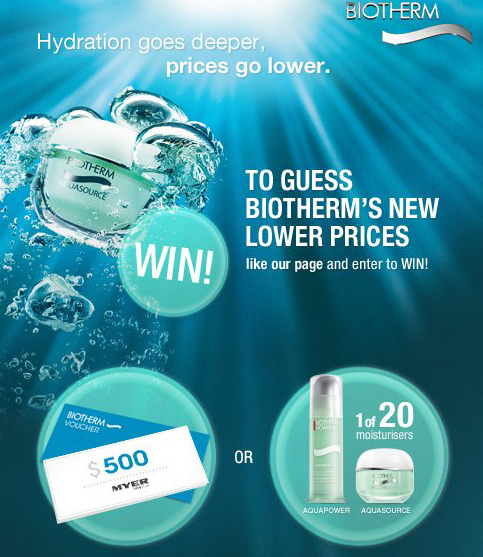 Head over to Biotherm's Facebook page to like them and start guessing away before it ends on 29th May.